Originally hosted by Leonard Nimoy, In Search of… was a series that explored unsolved mysterious and the paranormal. The show ran for five years and a hundred and forty-four episodes and was made due to the success of three one-hour long documentaries narrated by Rod Serling. In 2002 the show was rebooted with Mitch Pileggi but only ran for eight more episodes before being canceled. 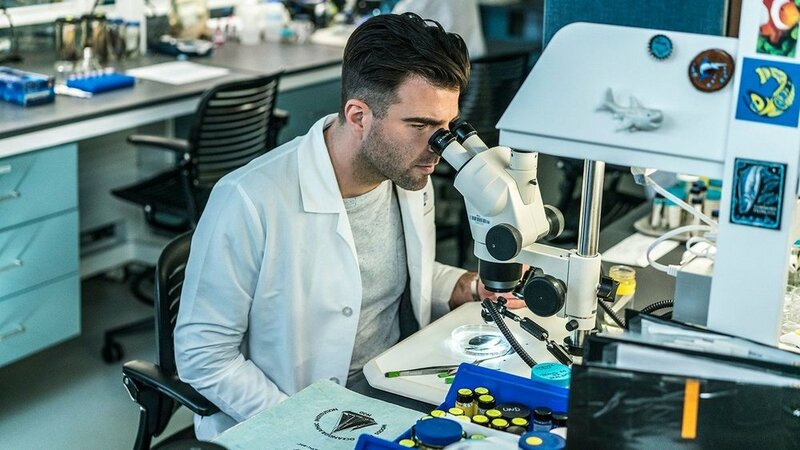 Now the show is back once more, but this time it’s being led by Zachary Quinto. Having taken over for Leonard Nimoy as Spock prior, Zachary Quinto looks to fill his shoes again, but to what end? While it’s always been fun to explore the unexplainable and impossible, in this day and age, with science having come so far it’s hard to take any of the material presented in this show very seriously. For one, Zachary Quinto’s hosting is not stellar. He is clearly trying to take the show seriously, but he couldn’t help but come off as disingenuous. I don’t expect him to believe what his guests are saying, as I don’t either, but I do expect him to actually mean it if says he does. Despite constantly taking the side of his guests, it did not seem like Quinto believed them at all. As fine as an actor Quinto is in movies and TV, he clearly wasn’t trying very hard to sell his belief on In Search of. On top of this, his narrating will likely never compare to that of Leonard Nimoy. I can only imagine how much better many of Quinto’s monologues would have sounded in Nimoy’s very iconic and more baritone voice. Overall, I think it would have benefited the show more to have a host with a little more science in their background too. Even though, Quinto has taken part in many different sci-fi related shows and movies that hardly makes him qualified to host a show like this. In fact, he often looked completely lost as scientific explanations seemed to go right over his head. In Search of is also often unintentionally hilarious. In the first episode Aliens, a woman administering a polygraph test starts off asking her test subject two very simple and reasonable questions. The first is whether his name is Kyle and the second whether today is Monday. After he answers those two questions, she immediately asks whether he saw a UFO outside of his house as a child and the episode hard cuts to a commercial. While this episode was very clearly trying to be dramatic, the unexpected jump and commercial cut were nothing short of hilarious. In addition, the face Quinto made whenever he was trying to look as if he was intently listening to someone was also quite priceless. I don’t know exactly what made it so funny, but he just kept squinting his eyes and puckering his lips. If I had to guess it was that he was trying way too hard to look as if he was perplexed, but it just made him look really silly with how often he made the face. One thing I can appreciate about the show is how it takes a scientific approach to its mysteries. In shows like Ancient Aliens the programs often present its information in a matter of factly way that everything it is saying is true, despite very little real evidence. This is the exact opposite of what In Search of did as the show constantly disproved all supposed evidence obtained. At first, I was a little worried when the show said that they were going to use a polygraph test to prove whether a man had been abducted. I couldn’t help, but roll my eyes as polygraph tests are known for their unreliability. Not to mention the fact that even if a polygraph test was one-hundred percent accurate, it would only prove that the man truthfully thought he had been abducted. To my surprise though, the man actually ended up failing the polygraph test as the women administering it determined he was lying. On top of this, the show also tested a piece of metal that a man claimed was a chip implanted in him by aliens. The chip tested positive for many of the same elements found in soil and was likely just a pebble the man had stepped on. The show could have very easily grasped at these straws and not did proper testing, but the fact that the show was willing to disprove what it was trying to prove, gave it credibility in my eyes. Despite this, the show still would constantly refer to these results as inconclusive despite the fact that they all but proved its conspirators claims false. In the end, In Search of fails to tackle anything new or exciting and only serves to disprove things already heavily investigated. As the show says itself, this kind of paranormal and extraterrestrial searching is for only the most optimistic. If you enjoy watching so-called believers disproved by science, you may find some worth in this series, but for anyone hoping to discover something new, you’ll likely be disappointed. I can see the appeal of a show like this in the late seventies to eighties when In Search of first premiered, as it was hard to prove or disprove these claims. In 2018 though, this series feels out of place and unnecessary as technology and science has come so far.